Women have been leaders throughout history, and today the tradition of volunteer female leadership continues to flourish. Yet in terms of paid leadership, women's elevation to top positions is relatively rare. Why do men still vastly outnumber women in leadership positions? 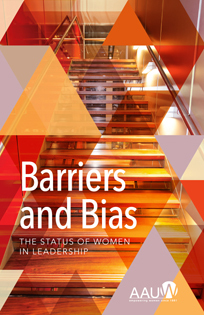 AAUW's newest research report, Barriers and Bias: The Status of Women in Leadership, explores this question, drawing from scholarly research and paying special attention to stereotypes and bias. The report provides recommendations for individuals and those in the education, corporate, and political sectors to contribute to an environment in which gender is no longer a barrier to leadership.